Join your fellow foodies to share in this communal dining experience, a tradition dating thousands of years! 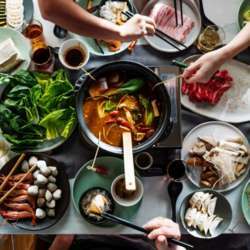 Most likely originating from Mongolia, hot pot spread throughout East Asia, where it is known under many names and in many regional variations: firepot, steamboat, jim jum (Thailand), shabu-shabu (Japan),and lau (Vietnam). You will be greeted with platters of raw ingredients surrounding large pots of broth, bubbling on the tables. Add in your creativity and personal variation to make your own bowl of goodness! Cost for the dinner will be $5 per person to contribute towards the dining experience. Event is also BYOB. Dinner will be held at a private residence in the Energy Corridor with address to be provided as the date nears.